Since the beginning of 2008 I have been introduced to several exciting fields of healing that make me more optimistic that in spite of the dark scenario regarding cancer and metabolic/degenerative diseases afflicting us more frequently, there is hope on the horizon that our ingenuity will yet save us from these scourges. These healing concepts, methods and machines range from the applications of little-understood scalar energy, informational medicine, DNA reprogramming, and cutting-edge million-dollar ( and mouthful ) rotational field quantum magnetic resonance ( RFQMR ). I will introduce two of these today and the others later. Scalar energy is described as “standing waves” or energy waves that do not move and do not behave like electromagnetic waves. They are naturally produced when two “mirror-image” electromagnetic waves cancel each other ( when these waves are resonant, they magnify each other ). Scalar energy is thought to permeate the entire universe, and every cell in our body, and positively influences our health. Because it is static, scalar energy cannot be detected by the usual scientific instruments. However, there are some machines that claim to detect scalar energy. Some say that Kirlian photography and GDV ( gas-discharge visualization ) detect scalar energy although the methods involved suggest that they actually detect bio-electric energy ( highly magnified ). Because of the uncertainty of its nature and behaviour, little is known about scalar energy although its proponents predict that in future we can even make drugs obsolete when we fully harness its potential. That will be a nightmare for the drug companies, but a boon for us all. Unfortunately, like nuclear force, it can also be harnessed for weapons of mass destruction. My interest in it was because two of my friends reported that their mothers, who both suffered from stroke and were wheel-chair bound, improved after wearing pendants made from fused volcanic minerals. I discovered that hundreds others have also benefited from improved energy levels to reduced pain, stiffness and headaches, and better sleep upon wearing the pendants. Many athletes and golfers wear them to improve their performance, and some mothers reported that their hyperactive children became calmer after wearing them. These “Quantum pendants” are said to emit scalar energy that act as healing energy to the cells, and can start the healing process even after it has stopped for many years. Scalar energy can also improve the health-qualities of water and food, and there are many testimonies from those who drink the scalar-energized water, including one lady who claimed it cured her infertility! The scalar-energy emitting minerals have also been imbedded into flasks, bangles and wristwatches. So there are many ways to benefit from this energy. Scalar energy sounds very much like qi – the healing life force, and I was forced to investigate. A search on the web reveals that mainstream science regards this as “pseudoscience”, but that is not surprising, as qi itself is pseudoscience – something that exists only for those who believe in it, but not accepted by the scientific community. But as a scientist who feels and can command it, qi is real and scientific to me, and I’m sure it is real also to the thousands others who have experienced it themselves. And definitely to the thousands who have been healed by qigong exercises when modern medicine couldn’t help them any more. Scalar energy is indeed different from the electromagnetic spectrum we are so accustomed to, and is very close to qi. In fact, qi has properties of both scalar and electromagnetic energies. Sometime back I wrote about the vivifier disc where I described how it helped many people with their illnesses and how fresh water fish can survive in vivified salt water. The vivifier is also made of minerals and crystals, but is much more expensive. It also works through scalar energy. So now those who would like to benefit from the healing effects of scalar energy have a much cheaper alternative. 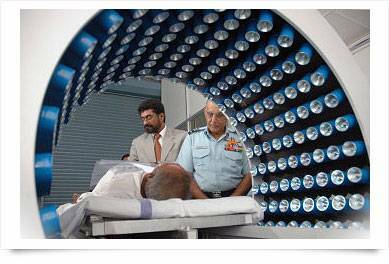 The Cytotron ( Rotational Field Quantum Magnetic Resonance – RFQMR – device ) was invented by biophysicist/radiobiologist Dr Rajah Vijay Kumar DSc of the Centre for Advanced Research and Development (CARD) in Bangalore, India. It uses electromagnetic beams and strong magnetic fields to modify the cell membrane electrical charge ( trans-membrane potential ) to cause tissue regeneration and repair for treating chronic or degenerative diseases such as arthritis. It is very effective in curing certain conditions such as a damaged knee by stimulating regeneration of the cartilage tissue, something which is difficult to achieve otherwise. It can also be programmed to cause selective cell destruction, and is therefore a powerful weapon against cancer. The treatment is non-invasive, painless and free from any side effects. The machine is state-of-the-art computerized gadget that looks very much like an MRI machine we are already familiar with, except that this is used for treatment. The first machine will soon be available in Malaysia, and hopefully will be able to help all those with cancer, arthritis and other diseases. Heart disease – stimulation of Angiogenic Growth Factor and promoting coronary and peripheral blood vessel growth; diabetes and diabetic neuropathy; reducing pain and disability due to trauma; carpel tunnel syndrome; migraine; epilepsy; tinnitus; osteoporosis; wound healing ; and many more. My main interest is of course its use against cancer. The Cytotron utilizes a totally different approach compared to conventional cancer treatments. Instead of the very high frequency ionising radiation used in radiotherapy, the Cytotron uses low power, non-ionising, non-thermal electromagnetic waves which have been shown to be safe and effective in clinical studies. The aim of Cytotron cancer therapy is not the immediate destruction of the cancer cells, but stopping the uncontrolled mitosis, putting the cell in a vegetative state and then die through apoptosis ( programmed cell death ). We already know that trans-membrane potential of the cells can have dramatic effects on cell functions, and that cancer cells have very low trans-membrane potential. Cytotron therapy increases the trans-membrane potential of the cancer cells from the unhealthy -20 mV to the healthy -90 mV range. By this change, some normal functions are re-activated and the uncontrolled mitosis of the cell ceases. Since all the patients were supposed to die, the outcome of the Cytotron therapy is indeed outstanding. All the patients were terminal cases who had already been poisoned by the chemotherapy and radiotherapy. It is expected that cancer patients who are not in such a bad state should respond even better. While there are expensive and sophisticated machines to help us recover from illnesses, it is still better to prevent. For this I recommend that you practice qigong as part of your strategy. In the past few months since I highlighted the healing power of Zi Fa self-healing qigong, many have come for practice and for therapy. Many stroke patients have made remarkable recoveries and are leading better lives. Cancer patients can also recover through qigong, as I have written many times. When the Cytotron is available, they will have another option to choose, but that will be much more expensive!